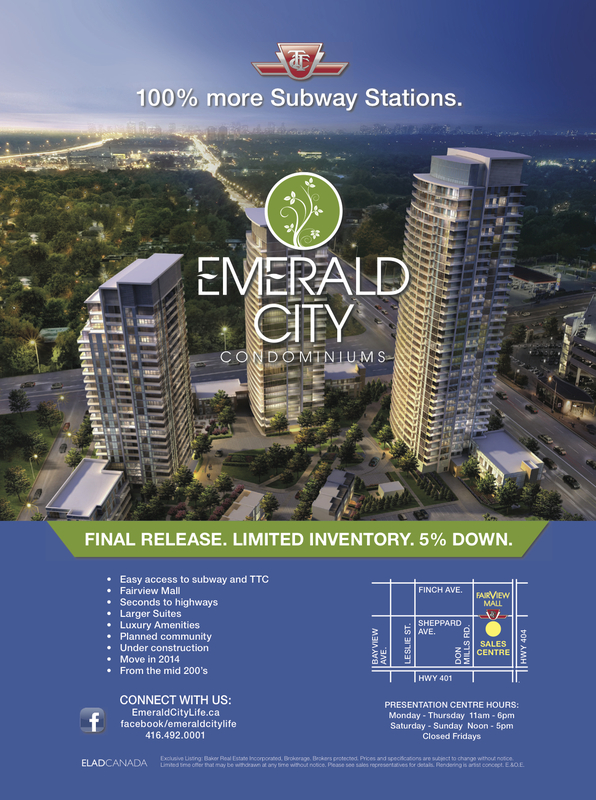 Concept development and artwork for Emerald City in North York, Toronto. Video created with Barbara Lawlor of Baker Real Estate. The video consists of an interview with her, footage taken around the development and vicinity and renderings of the development. We created a 30 second TV spot for Emerald City using only static renderings and images. BEFORE: The Presentation Centre before the re-design. The building needed a face lift. AFTER: Presentation Centre interior after re-design. All points of contact now in sync. BEFORE: Interior of the Presentation Centre before re-design. The interior lacked any connection to the selling messages being used elsewhere. AFTER: Our design for the exterior of the Presentation Centre. We recommended using stunning, visually eye-catching graphics. Email creative and HTML development. Social Media setup and posting. Facebook. Pinterest. Twitter. YouTube. It’s all about the numbers for Emerald City. As the competition became even more heated in the Condo Development market, we recommended that ELAD Canada approach their target audience with the facts. We used the concept of the “numbers” to help understand the difference between what Emerald City has to offer verses the its closest competitors.